You only have to fill in the information without the * beside it. 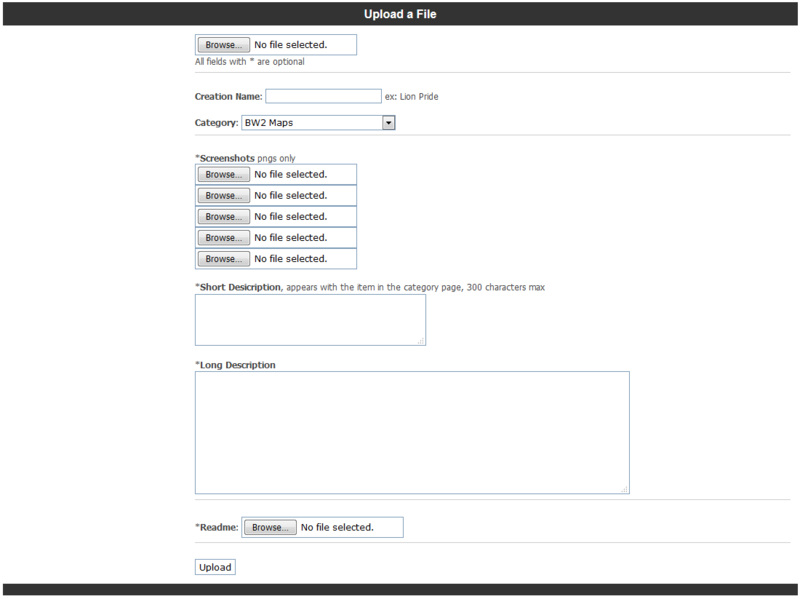 That is you'll have to fill in: Creation Name, Category, and of course provide a file to upload! For uploading a file you must click the first browse button, this will open a file dialog. You must then find the file you wish to upload and open it. We are only allowing you to upload zip and png files. Members cannot upload exe files! Only admins can upload exe files. This is simply because of security concerns. If you want to upload an exe file and are not an admin you may contact us through the private messaging system on this website. Also zip files are searched by the website for exe files, if one is found your file will not upload. Only png files are allowed. There is a maximum of 5 screenshots allowed. BBC code is not allowed in the short description but is allowed in the long description. If you are unaware of what BBC coding is, its what this website uses to allow you guys to style up your topics and messages, you know the  [/] stuff . Only txt files are acceptable. When the upload button is clicked, and you passed all the security checks your file will be uploaded and view able to the public. At the old page kayssplace, i mean, there was a limit of 15 MB. And how we can edit files? My last upload (B&W CI Player Extrasettings 1.0b) from the old page "kayssplace" is an extern link and in the next days I want to upload a new version of this tool. But I can't edit this file. You can't edit them, for now anyways. But what I can do is remove your old version of B&W CI Player Extrasettings 1.0b, which will allow you to upload the new one.